In the late 40s and early to mid-50s times were much simpler, and on a grand average a little better than they are today. Born in 1938 I was in my preteens during this post-World War II period. Being the middle born of 13 children there were always siblings to play with. As I sit here at my computer as midnight approaches on what has been a rather dreary rainy day I decided to enjoy a dish of ice cream as a nice late night snack to brighten my day before retiring for the night. I scooped several spoons full of vanilla ice cream into a cereal bowl and liberally applied some caramel topping. As I perused all the comments of my friends on Facebook I greatly enjoyed the delights of my preferred concoction. Suddenly I recalled those times in the distant past when as a boy one of my brothers and myself would walk the ½ mile to our neighbor’s home. There for a matter of a couple of hours we would while away the time playing a card game called Pedro with Ralph and Gladys Mayne. They would have been in their 50s at the time. Who won the games was of little importance. An evening of entertainment was what we all desired. At the end of the evening Gladys would always bring forth ice cream to be eaten by all. What a great treat this was to a couple of children I’m absolutely sure they realized. Here it is now some 65 years later, and yet I remember those wonderful evenings so long ago. 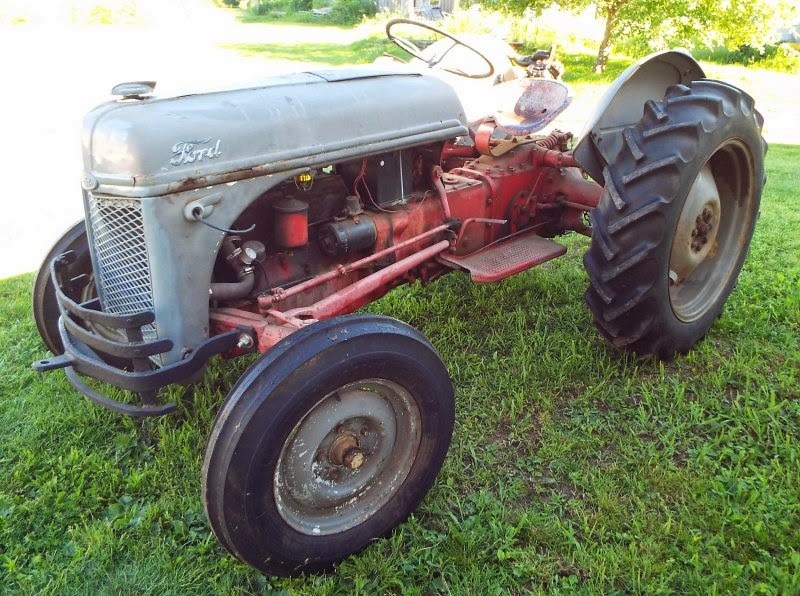 I recently bought a 1949 Ford 8N farm tractor which I plan to use for snow removal in the coming winters. My thoughts ran to installing a loader, and, in turn, in some manner attaching a snow plow of some kind to the bucket on the loader. I spotted an advertisement on Craigslist for an old loader located some 40 miles from my home. As I have no equipment with which I could bring a heavy loader to my home, I enlisted the aid of my nephew Les. He owns a larger than average Ford 350 pickup, and has a flatbed trailer attached with a fifth-wheel hitch. He agreed to go with me to look at the loader, and if I bought it he’d cart it home for me. A good plan. He asked me to drive to his home so he wouldn’t have to turn his long rig around at my place. I was a bit concerned to learn he had misgivings about turning a truck around on my 10 acres, but I drove to his home with my 2014 Jeep anyway. After parking in his yard we proceeded on to our destination. I bought the old loader, and the former owner said he would load it on Les’ trailer for us. He started an old Ford 800 tractor, and attached a boom pole to the three-point arms. This is an approximately 6 foot long pole used to lift heavier objects. His tractor ran out of gas. After adding some gas, the battery was dead. He jumpered the battery using a separate battery apparently kept for this purpose, and got it running again. With a moderate amount of confusion we finally got the thing loaded on the trailer. Les drove us back to my home where I used my recently purchased 8N to tow it off onto the ground where it landed upside down. Just then my nephew Don and his pretty wife Diana drove into the yard after driving all the way from Alabama. After conversing in the yard for a few minutes Les decided to go home while I entered my home with the guests for a nice afternoon chat. Later that evening my wife asked me where my Jeep was. I told her it was in the front yard where it is always parked as far as I knew. She said, “No, it’s not.” I looked out to discover she seemed correct, I couldn’t see it either. I searched my memory (what I have) to try to think if I had left it out back for some reason. I couldn’t recall having it out there for any reason. I was about to panic and call the State Police to report it stolen, but I had the keys in my pocket. How had a thief managed that? My wife casually asked, “Did you leave it at Les’? July 10, 2014 I bought a 65 year old farm tractor. This is not intended to be a complete restoration project by any means. I bought this thing to work with although I have little use for it other than snow removal. In an “as is” condition I believe the engine and drive train are good. The three-point-arms work correctly. It has a refurbished radiator newly installed, and a new 6 volt battery. It has had a recent engine tune up. The rubber is decent. The grill is home made. The grill guard has been bent and straightened in the past. There is a rusty place on the hood. The headlights are in a separate box. It started and was driven onto a trailer to bring it home. This was a good start. After it arrived at my home it started, ran, and was driven around my yard. The next morning I found it only wants to run for a couple of minutes and then quit. It seems to be running out of gas. After a couple of minutes it will run again. I found the fuel strainer on top of the sediment bulb partially plugged and cleaned it, but that didn’t change anything. More later as it develops. My neighbor has a this huge Saint Bernard that usually does its duty in my side yard where the deposits sun dry into objects similar to frozen hot dogs, only larger. I was mowing my lawn one afternoon when I heard this high-pitched ziiiiiiing as one went flying off the blade, through the chute and off into space. The mower temporarily stalled from the effort required to launch this missile. The TV cable running past the front of the house gave a twang as it apparently was struck by a UFO. Less than a second later I heard someone on the third hole of the golf course holler, "I never even heard anybody say 'fore' or I would have ducked," as he groggily rose from the ground. Only another split second passed before I heard the tinkle of glass over toward the bowling alley as the lady in the pink miniskirt screamed, "Well would you look at that for heaven’s sake, I got a strike and I never even threw my ball! How do I score that?" I decided to quit mowing for the day. While in the U S Navy I was taught some 59 years ago about radioactive decay. In simple terms, which is all I know, radioactivity will decay in half-lives. In some certain period of time half of the radioactivity will dissipate. In that same length of additional time, a further half of the remainder will disappear. This will continue forever. It can be deduced that the radiation will never entirely disappear. Keeping that in mind, I have noticed that actuarial tables work in a similar fashion. I am approaching 76 years old. Assuming I live until my 76th birthday then according to the Social Security actuarial table I would, as a male, expect a further 10.28 years of life. This obviously means I should see my 86th birthday. Further perusal of the very same table shows that if I reach my 86th birthday, I should expect another 5.4 years of life meaning I should pass my 91st birthday. When I reach that milestone the very same actuarial table shows I can expect yet another 3.7 years, or until past my 94th birthday. Continuing on this line I should reach 97 years of age, and receive another 2.49 years, or until past 99 years. Believe it or not this just keeps keeping on. At 119 years of age I yet have a further .61 years promised. The final conclusion, like the radiation decay rate, is that I’m never going to die. Social Security has discovered the elusive Fountain of Youth searched for by Juan Ponce de Leon in 1513 in what is now Florida.